In 1990, Lars Wikander and Mike McDowell, two adventurous spirits with a hankering to visit the North Pole, founded Quark Expeditions. Following the collapse of the Soviet Union, they specialized in expedition cruises to the Arctic and Antarctica using Russian icebreakers suddenly available for charter. In 1998, Wikander became the company's majority owner. In 2007, Quark Expeditions was sold to First Choice. It's owned by the British company TUI Travel, and its president is Andrew White. Among its firsts, the company counts the first-ever tourism transit of the Northeast Passage across the Russian Arctic in 1991 and the first circumnavigation of Antarctica for commercial passengers in 1997. Quark Expeditions continues to offer polar travel only, be it north to the Arctic (June through August) or south to Antarctica (November to March). 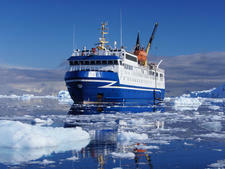 Arctic cruises may cover Canada, Greenland, Spitsbergen or Iceland. Southern itineraries generally cruise the Antarctic Peninsula and might include the Falklands and South Georgia. 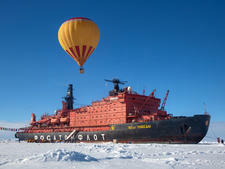 A former Russian scientific vessel, 50 Years of Victory affords the ultimate North Pole adventure with Zodiac boats, a helicopter and hot air balloon for sightseeing. Think of Quark Expeditions as providing floating basecamps for exploring the most remote regions of the Arctic and Antarctic. The ships are small in size, allowing them to venture where other ships can't go. They provide creature comforts, transport and exceptional opportunities for learning about polar wildlife, history and landscapes from experts in their fields. They are also a base for shore landings via Zodiac and, at an extra cost, sea kayaking, cross-country skiing mountaineering, camping and stand-up paddleboarding. Life onboard is casual and informal, no matter how luxurious the ship and cabins may appear. Depending upon the ship, your cabin may be a suite with a balcony (available on Sea Spirit, Sea Explorer and Ocean Diamond), contemporary Scandinavian (Ocean Nova) or quite basic (Sea Adventurer). In reality, you're rarely in your digs, what with Zodiac excursions, talks by expert naturalists, daily recaps, dining and hanging out on deck for views of wildlife and icebergs. Entertainment is of the natural kind provided by polar bears, penguins and whales, rather than flashy manmade shows. Most Arctic voyages are inclusive of beverages, as well. Quark Expeditions attracts curious, active adventure-seekers from around the world. All share a desire to discover the poles in an environment that's both exhilarating and educational. They're flexible and eagerly expect the unexpected. Passengers are evenly divided between men and women. Ages, as well, are equally represented, ranging from 25 to older than 65. Quark Expeditions claims to have the largest, most diverse fleet of expedition ships cruising in polar regions. The ships are chartered -- not owned -- by Quark. Each is ice-strengthened and equipped with Zodiacs for shore landings. 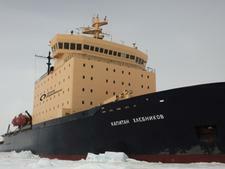 Notable among the fleet is 128-passenger 50 Years of Victory, a nuclear-powered icebreaker sailing to the North Pole. Completed in 2007, it has two nuclear reactors capable of producing 74,000 horsepower, and it can break through ice up to 9.2 feet thick. The ship has a helicopter for aerial sightseeing. Meanwhile, 4,200-ton, 114-passenger, all-suite Sea Spirit (built as Renaissance V) and sister ship, 111-passenger Sea Explorer (originally Renaissance VII), are luxurious, yacht-like expedition ships. They were built in 1991 in Italy and renovated in 2004. 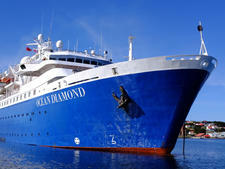 The 8,282-ton super yacht Ocean Diamond was built in 1986 and formerly sailed as Song of Flower. It is one of the largest of the line's small ships, carrying 189 passengers. Sea Adventurer (117 passengers, 4,376 tons) was built in Yugoslavia in 1975 and refurbished in 1998. It's popular with several expedition cruise lines, though it's showing its age. The most recently added charters are Ocean Nova and Ocean Endeavour. The 2,183-ton, 78-passenger Ocean Nova was built in Denmark in 1992 to sail the ice-choked waters of Greenland. It was renovated in 2006. 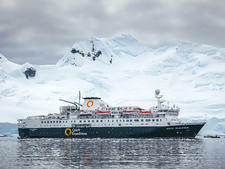 Ocean Endeavour, with room for 199 passengers, is the only polar adventure ship in Antarctica focused on health and wellness. The 12,907-ton ship was built in Poland in 1982, renovated in 2014 and features saunas, a pool, gym and wellness cafe.